Between the years 1950 and 1990, the top tourist attraction for Latinos was the popular resort and hotels known as Las Villas of Plattekill located in New York. Originally owned and operated by Spanish immigrants, and later by Puerto Rican families, Las Villas was the original dance clubs that served as a summer vacation hot spot for Latinos that gave birth and rise to tropical music mambo, salsa, rumba, and merengue in the United States. Las Villas became a forum for showcasing live musical artists who would go on to become Latin music legends such as El Gran Combo, Ray Barretto, Celia Cruz, Tito Puente, Oscar D’Leon, New Swing Sextet, Chuito Velez, and many others. While their music gained popularity, Las Villas, too, became famous for introducing fresh musical performances that arrived there straight from the Caribbean in which is what now today forms part of the Latino's cultural heritage. 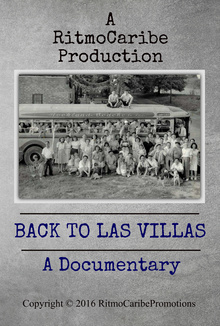 The first film project of Ritmo Caribe Promotions, “Back to Las Villas,” is a special tribute that fulfills the purpose of bringing back the nostalgic pleasure for those who grew up in the musical era of the original great bands and artists.